Friday Breakfast, originally uploaded by All Things Mimi. I love breakfast when you don't have to be anywhere at a certain time. Nothing starts the day better than a big, leisurely breakfast. 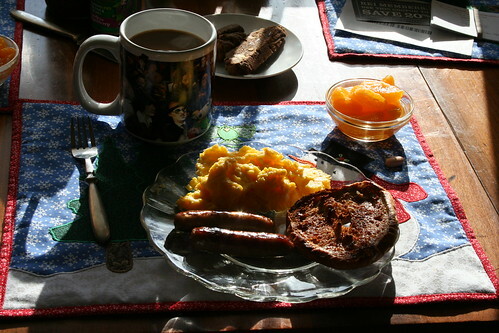 This morning we were both off, so I fixed scrambled eggs, maple link sausage, toasted bagel, orange segments and in the background you see a small plate of the Double Chocolate Chunk Biscotti I made last night. This should keep us going for a day of cream cheese making, and a visit to the hot spring tonight!